Hidden in Koreatown on the 3rd floor is the best Korean version of chicken noodle soup you will ever find for this cold rainy weather. Just follow the stairs with walls decorated of kids playing traditional cultural games up to Arirang and you will be happily greeted by Mama Arirangs cooking. She likes to walk around asking how everything is. This is an example of murals to follow. Yeaaah, not kiddy p0rn--apparently, this game is called "hammer a pile" in Korean and "thick milk" for Romanians. News to me, since I grew up in the US with only "hide-and-go-seek" and "duck-duck-goose". If youre curious to learn more, heres a youtube.com link to show you how to play this game. But, back to chicken noodle soup. Im a huge noodle fan. For $10 you get a huge bowl full of kalguksu (knife-cut noodles) and sujaebi (hand pulled noodles). If you order the combo of both types of noodles its shortened to "kal-jaebi"--highly recommended bc you get the mix of thin long noodles vs gnocchi ish thicker shapes. 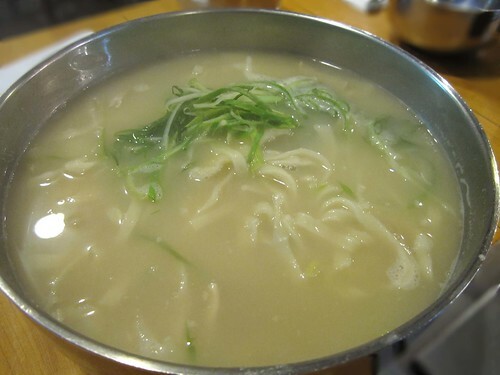 There are a variety of broths to choose from: chicken, anchovy, seafood or kimchi. I had the chicken broth, which is nothing like Campbell's filled with tons of sodium, and other canned vegetables like celery and carrots. Arirang keeps it simple. They concentrate more on the natural flavors of the chicken broth and textures of noodles topped with scallions; theres hardly any chicken meat, but is definitely made from a chicken. Its just about everything you would need to cure this dreary NY weather. Easily shared between 2 people--but dont be shocked that I ate one all by myself. Also comes with 2 types of kimchi banchans. **If you like Arirang, but want a cheaper version of knife cut noodles and hand pulled noodles try Sheng Wang or Super Taste in Chinatown -- not a fan of LanZhou though, so skip that. They dont have chicken, but their beef noodle soup and tong-gu (pork bone) is goooooood.